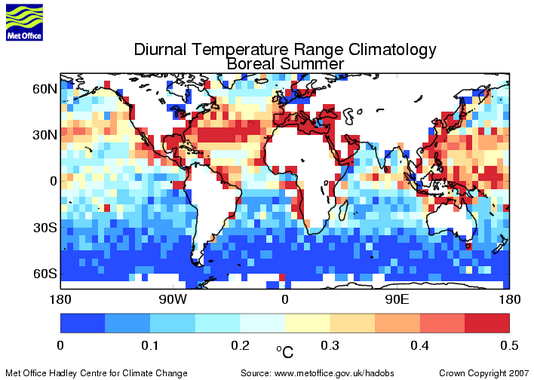 The Hadley Centre sea-surface temperature diurnal temperature range climatology is a 5°latitudex5°longitude gridded climatology of the diurnal range of sea surface temperature as measured by drifting buoys. The SST data are taken from the International Comprehensive Ocean-Atmosphere Data Set, ICOADS, from 1990 to 1997 and from the NCEP-GTS from 1998 to the present. HadDTR is produced by taking in-situ measurements of SST from drifting buoys, separating them into hourly bins according to the local time of the measurements, rejecting measurements which fail quality checks, converting the measurements to anomalies by subtracting climatological values from the measurements, and calculating a robust average of the resulting anomalies on a 5° by 5° degree monthly grid. A function describing the shape of the average diurnal cycle is then fitted to the data and the diurnal temperature range is extracted. For a detailed description of the dataset and its production process, see the paper cited in the references section below. We recommended you read this before using the data.